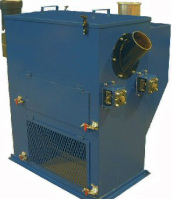 SAFE Systems, Inc. designs and manufactures custom abrasive air blast facilities to meet the requirements and specifications of its customers. A variety of configurations are easily customized for your requirements. We don't sell "off the shelf" or have only a few standard sizes and layouts to choose from. We build what you need. Click on photos to enlarge. 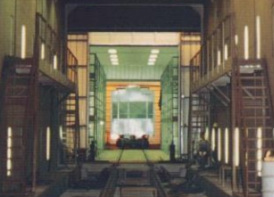 This room has rubber rollup doors on both ends, double rows of wall lights and catwalks along each side.